Postponement of the vote on anti-abuse regulations in the US was sent to the Episcopal Conference in a letter that Cardinal Marc Ouellet, Prefect of the Congregation for Bishops, sent on Sunday to Cardinal DiNardo by the apostolic nuncio Christophe Pierre. It was due to the fact that the text arrived in the Vatican too late to be studied and discussed. Thus, there are problems with the canonical norms, as some of the “standards”. In a Nov. 13 interview with host Msgr. Jim Vlaun during "Conversation with Cardinal Dolan" on SiriusXM's Catholic Channel, Cardinal Dolan explained, "However, I think the bishops quickly took a deep breath and said, 'Wait a minute, that's still doesn't keep us from talking about it." "That still doesn't keep us from giving Cardinal DiNardo a sound sense of direction as to where we should go and almost to deputize him to bring that to Rome at the February meeting." "I think we bishops in the United States keep reminding ourselves, 'Whoa, wait a minute, we are Catholic. We are members of the church universal and we are a small segment of the church universal,'" clarified the Cardinal. "We know here in the United States, this is not just a Catholic problem. We're talking about the sexual abuse of minors. It is a problem in every religion, every organization, every family, every institution, every school." "It is not just a Catholic problem. ... Nor is it just an American problem. Now, we know that it's throughout the world," Cardinal Dolan said. "So I think what the Holy Father is saying, 'Wait a minute, we don't want you to get too far ahead here. We appreciate what you're doing in the United States, but we want you to be part of the universal discussion.'" 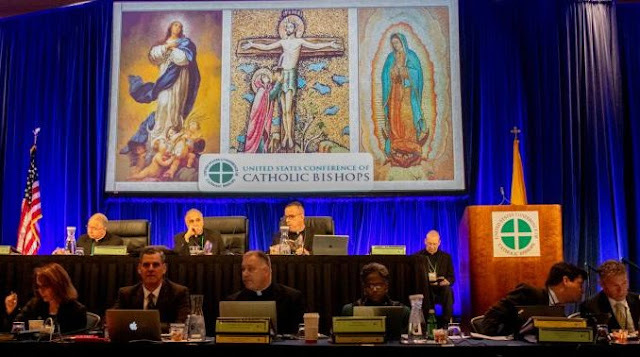 "It is wrong to think the Holy See does not share the objective of the U.S. bishops to have effective instruments for combating the phenomenon of the abuse of minors and to establish firm points regarding the responsibility of bishops themselves. The motive for asking for a postponement (of the vote) should not be considered putting on the brakes, but an invitation to better evaluate the proposed texts, including in view of the meeting in February of all the presidents of the bishops' conferences of the world with the pope dedicated to the struggle against abuse." They went on to explain that problems have arisen with some inconsistencies found between the contents of the document concerning the national commission on the responsibility of bishops and the Code of Canon Law. The Apostolic Nuncio Pierre during the opening of the Assembly quoted Georges Bernanos: "those who claim to reform the Church with the same means used to reform temporal societies will not only fail but will put themselves infallibly outside the Church. The Church can be reformed only through suffering, we can’t reform the visible Church unless we suffer for the invisible Church. The vices of the Church cannot be reformed unless we boast example of her most heroic virtues"
The nuncio explained “one must not renounce the responsibility of reforming oneself first of all, nor can one "transfer the deposit of trust to other institutions. Regaining trust is not enough. When it comes to the responsibility we have for children and vulnerable adults, we must show that we can solve problems, instead of delegating them to others".